Mirror, mirror, on the wall, which is the best desktop environment of all? While diversity is one of the best features of the Linux community, as users can try various options and find out which one suits the best for them, sometimes it can also create confusions. Especially if you’re new to Linux community, you can easily be overwhelmed by the number of choices you have. When it comes to Desktop Environments, there’s no exception. But trying out each and every desktop environments is a very time-consuming and tiring task. Here, we’ve created a list of the best desktop environments available for Linux distros along with their pros and cons for you. Just to mention, this is not the list for the best desktop environment for programming or any such specific purposes. Also, the list is not in any specific order. Here’s a video on the same topic from our YouTube channel. KDE, rather than being only a desktop environment, is actually a collection of applications, one of which is the desktop environment itself. 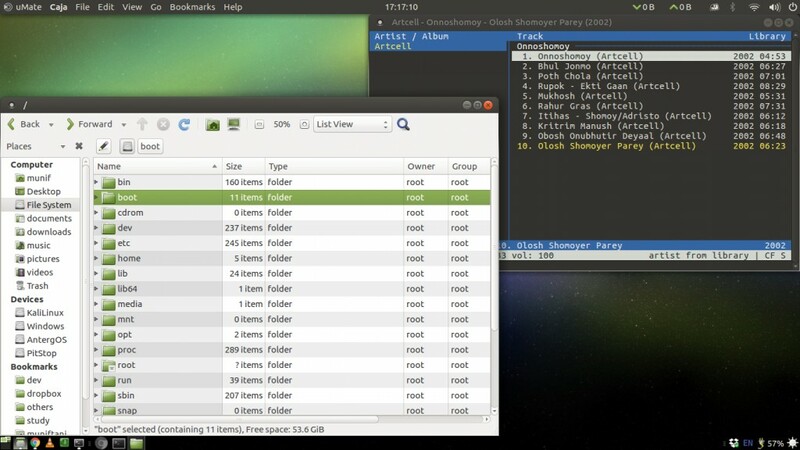 The latest iteration of KDE is called Plasma, which comes in two variations – Plasma Desktop and Plasma Netbook. KDE is the most customizable and flexible desktop environment available out there. Where other desktop environments need extra tweak tools for customizing, for KDE it’s all baked into the system settings. You can personalize you desktop environment experience according to your needs without any third-party tools. You can download widgets, wallpapers, themes without even opening the web-browser. KDE offers a good collection of basic applications and is compatible with all kinds of applications even if they’re not built using KDE Development Platform. The applications KDE comes bundled with offer various essential features, absent in their alternatives. Whether you want a desktop environment that works just out of the box or you want a fully customized desktop experience, you can definitely choose KDE. The major Linux distros using KDE as default are openSUSE and Kubuntu. Most advanced, powerful and feature-rich. Modern and polished user interface. Highly customizable and flexible experience. Wide range of software compatibility. Some components might seem too complicated to use. MATE Desktop Environment is based on the codebase of currently unmaintained GNOME 2. MATE was initially developed for the users who were disappointed with the latest iteration of GNOME shell – GNOME 3. Being a fork of an older desktop environment doesn’t mean that it runs on those obsolete technologies used back then. It just means that MATE took what already works and now continues to improve upon it using modern technologies. MATE Desktop Environment offers the traditional desktop experience with a hint of modernism. And because it’s built on something that’s been tested and tweaked for years, it works seamlessly. It supports panel system with various menus, applets, indicators, buttons etc. and can be arranged however the user wants. MATE comes with a collection of basic applications, most of which are forks of GNOME 2 applications. One other thing that makes MATE wonderful is that it consumes only a very small amount of memory for itself and thus is able to function properly on older and less powerful hardware. Ubuntu MATE uses MATE as its default desktop environment. Interface might seem old (because it’s intended to be). GNOME is one of the most popular desktop environment in the world of Linux distros. Many of the popular Linux distros use GNOME as their default desktop environment and it has some popular forks, such as – Cinnamon, Unity etc. GNOME is designed to be easy to use and customizable. The latest iteration, GNOME 3 has a modern and attractive user interface and aims to provide better support for touch-based devices. GNOME contains almost everything a modern desktop environment should have. Those who are uncomfortable with the modern user interface that comes with GNOME 3 and prefers the good old GNOME 2 experience, it provides a classic mode as well. Dashboard, system-wide search , powerful in-house applications that get the works done, themes, extensions support, window snapping are some of its key features. However, tweaking this desktop environment requires gnome-tweak-tool to be installed. In version 3.18 it has introduced some interesting features like integrated Google Drive in the file manager. One of the downsides is that GNOME 3 draws a lot of memory because of its graphically heavy interface compared to some of its alternatives. Some major distros using GNOME are Debian, Fedora, openSUSE and Ubuntu GNOME. Can extend functionalities through Shell Extensions. Extension management is not satisfactory. Cinnamon, a fork of GNOME 3, was initially developed to be and is the default desktop environment for Linux Mint. It is known for its similarities with the Windows user interface which helps the new Linux users from feeling uncomfortable with unfamiliar user interfaces. Cinnamon contains various customizable components like the panel, themes, applets and extensions. The panel, initially across the bottom edge of the screen, is equipped with a main menu, application launchers, list of open windows and the system tray. Cinnamon comes with various basic applications including some forks from GNOME 3. Budgie is the newest in this list of desktop environments. It was created as the flagship desktop of Solus Linux. Though it is still being developed by Solus team, it’s intuitive and elegant interface made it popular among other distribution users. As a result, you can get Budgie in SUSE and Arch based Linux distributions. Ubuntu also has an official Budgie flavor, unsurprisingly called Ubuntu Budgie. Budgie is based on GNOME. The looks and other Budgie specific changes are managed by Budgie settings while the rest of the settings can be configured by the regular GNOME settings. As far as the system resources are concerned, Budgie is not that resource hungry but it’s not lightweight desktop environment as well. A moderate system with 2-3 GB RAM is sufficient for Budgie. Not suitable for low-end system. LXDE is an extremely fast and energy saving desktop environment. It’s designed to be lightweight and user-friendly while keeping the resource usage low. It embraces modular approach so that each of its components can be used independently and that’s what makes LXDE porting to almost every Linux distros, as well as BSD and Unix, easier. LXDE comes with various code desktop components, accessories, system & configuration tools. It’s used in Lubuntu as default desktop environment. The successor of LXDE, combining two open source projects LXDE and Razor-Qt, is LXQt. LXQt’s currently under development and aims to be lightweight, modular, blazing-fast and user-friendly desktop environment. It’s already available on a wide range of Linux distros. Extremely fast performing and lightweight. Supports almost every Linux distros. User interface may seem unappealing. Xfce is one of the most lightweight desktop environment for Linux, BSD & other Unix-like distros. Xfce offers a lite but modern, visually appealing and user-friendly interface. It comes with all the basic features you’ll need along with a decent set of applications. Manjaro Linux and Xubuntu has Xfce as default desktop environment. Lightweight and adaptable to old hardware. Comes with less application installed. Every desktop environment is distinct in their nature and purpose. Which one’s the best desktop environment for Linux, actually depends on your needs. You have to try a few and decide for yourself which one suits you the best. So, which desktop environment you use? You can share your desktop screenshots with us in the comment section. (P.S. : The screenshot of MATE on Ubuntu MATE is mine).